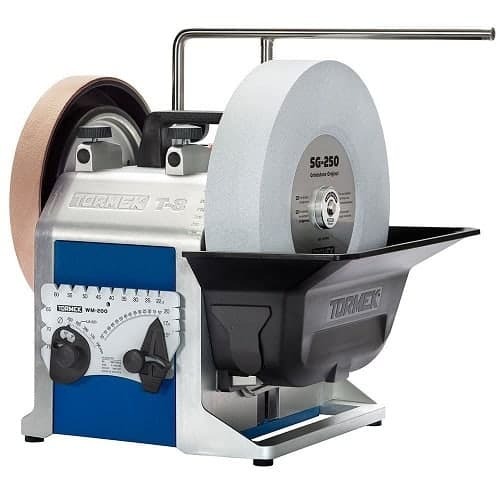 The Tormek series of sharpening grindstones have proven very popular with professionals and hobbyists alike. Whether you need to sharpen knives for the kitchen, or chisels for the workshop you can count on a Tormek to get the job done. 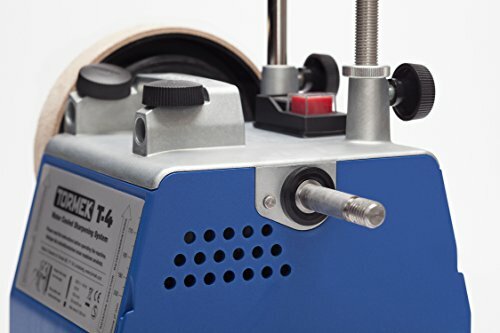 However, with the various models available as well the different packages that come with them, it can be difficult to know which Tormek sharpener to buy. If you’re currently scratching your head, we’ve pulled together this buyer’s guide. 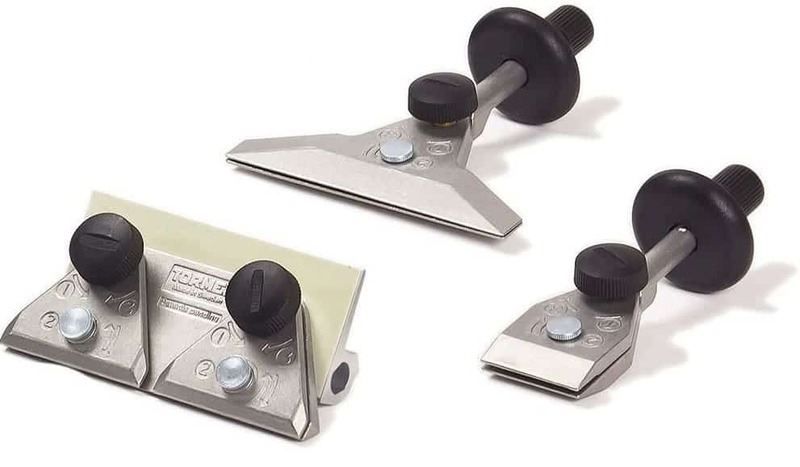 We have also reviewed the 3 main Tormek sharpeners currently for sale, along with an in depth look at the accessories you can opt for. For our findings at a glance, just head to the table below. For detailed information on each of the options, keep on reading. 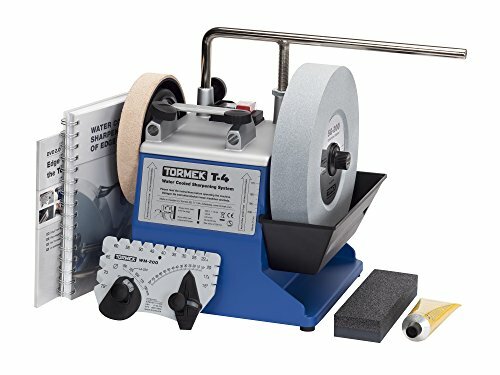 What is the Tormek Sharpening System? The Tormek sharpening system comes in 3 distinct models; the T-4, T-7 and T-8. We will take a look at the differences of each model shortly, however each is a precision crafted sharpening grindstone that utilises efficient water cooling technology to sharpen all manner of tools. In fact, if your blade requires maintenance the Tormak will have a configuration to meet the demands of the job. As the manufacturers so aptly state themselves, the lifetime of a broad range of tools used in woodworking shops, garages, gardens and art studios can be extended when maintained properly with a Tormak. Before we get to our main package review section. 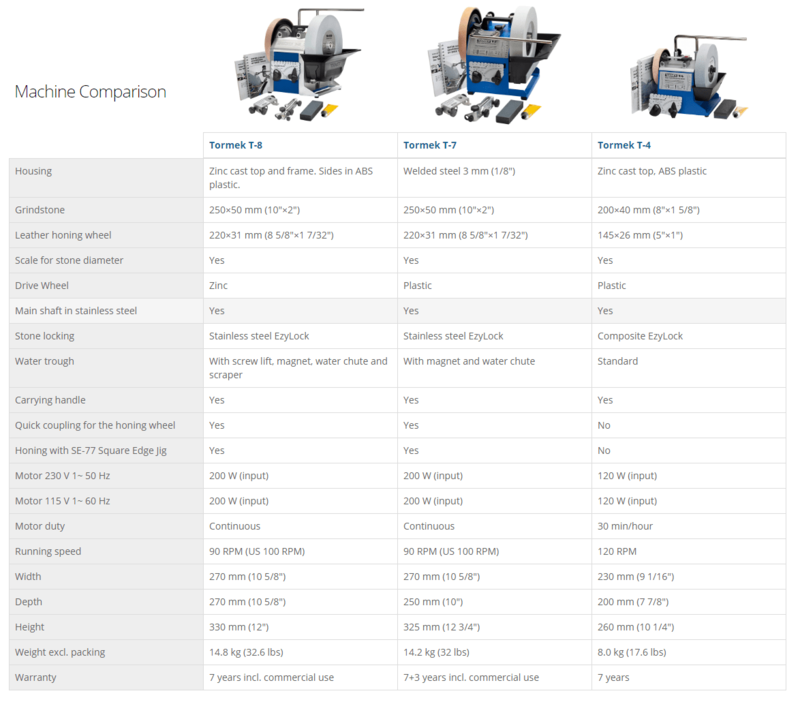 Let’s first compare the various specifications of the 3 main tormak systems currently available. With the varying specs of the tormek models, and a wide array of accessory packages to choose from it can be difficult to know which series to buy. In this review section we hope to clear that up for you. Here are our top choices. The feature that makes this T7 package stand out from the crowd and be worthy of our top pick choice is the fact it comes with an incredible 16 jigs. And for those in the know, it is the Tormek’s versatility that makes it an industry leader. At the heart of the system you have the Tormek guide rod. 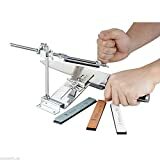 The jigs are attached to the system and when worked in conjunction with the guide rod offer you the full gamete of sharpening configurations. The rod on the Tormek T7 can be positioned so that the blade works against or away from the rotation of the stone. The grinding angle can be measured by the included gauge. A great feature is the fact that this gauge automatically re-calibrates to allow for changes in the stone’s diameter as it wears down. The versatility extends to the sharpening grindstone wheel too. Depending on the level of sharpening required, the wheel (normally 220 grit) can be prepped to 1000 grit by holding an included stone against the wheel. The advanced SG-250 10”x2” wheel can be operated at a slow and controlled 90 RPMs. Not only does this aid sharpening efficiency, (while also reducing wastage on the surface of the wheel), the water cooled system means you will have difficulty overheating the T7 – even during extended commercial grade use. Let’s talk more about those jigs however. This ultimate package comes complete with 2 specialised Tormek accessory kits. 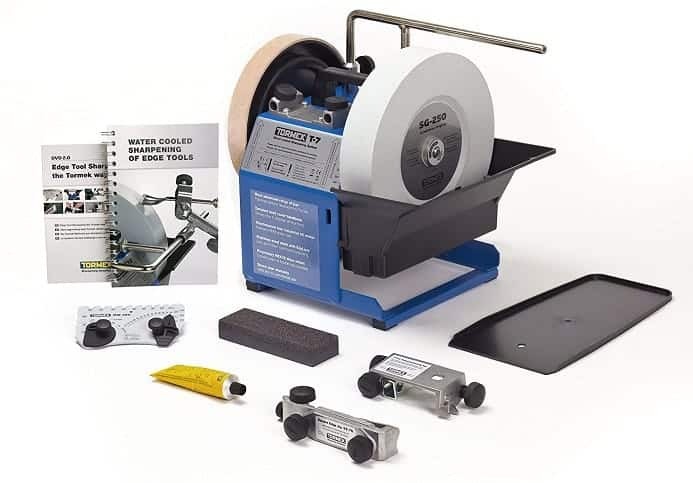 The Woodturners kit includes the following tools: Tool Rest with Torlock, Universal Gouge Jig, Profiled Leather Honing Wheel, Multi Jig, Turning Tool Setter, Machine Cover, Profile labels, and Turners Instruction Box. The value for money continues with the inclusion of the Hand Tool Kit. Here Tormek provide an additional Small Knife holder, Knife Jig, Long Knife Jig, Scissors Jig, Axe Sharpening Jig and Short Tool Jig. Finally, you have the standard accessories that come with a shipped Tormek T7. The aforementioned grinding wheel of course. There’s also an 8-3/4″ x 1-1/4″ genuine leather honing wheel, an Angle Master, Honing Compound and Stone Grader. For an extra fine finish the manufactuerers also provide a Diamond Truing Tool and just for good measure, (in case you didn’t have enough jigs already) a Square Edge Jig. The system also comes complete with a comprehensive handbook and instructional DVD. Even beginner sharpeners can get engaged with this particular beast and will be repairing their blunt edges in no time at all. The T-7 manufacturer’s guarantee speaks volumes on just how well built this stool is, (and the confidence the manufacturers clearly have in their product). A whopping 7 year warranty is included to cover damage. Furthermore, the T-7’s water-cooled nature increases the overall lifespan of system components. The end result is that you save on general maintenance costs. And if you’re working with tools in a professional environment (where they take a daily beating), this is peace of mind you will come to rely on. Water cooled system that does not overheat. 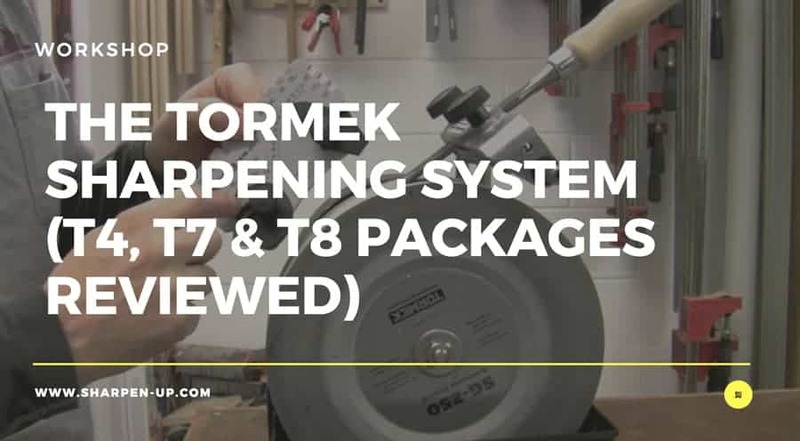 The Tormek sharpening system magnum bundle TBM703 T-7 is the very essence of versatility. The T7 has an impressive reputation in the sharpening industry anyway. 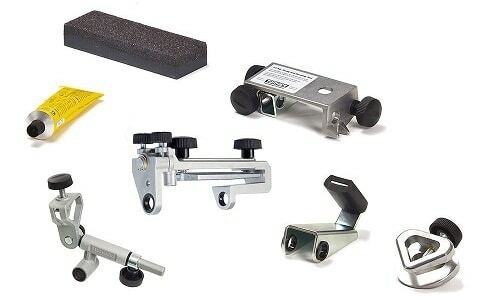 Add this amount of jigs and accessories and you have a package that basically covers all sharpening requirements. Our number one pick for good reason. The beauty of the Tormek T8 water cooled sharpening system is that heavily damaged and dull blades can be transformed into razor sharp, polished cutting edges in a matter of minutes. At the heart of the updated T8 is an even slower (when compared to the T-7) 80 RPM motor. This is used to turn a large 10″ aluminum oxide wheel (the main grinding wheel) as well as the additional leather honing wheel. As we didn’t go into full detail on the water cooling system in the Tormek T7 review, let’s take a moment to discuss it here. As you can see from the image above, (as well as the included video reviews), the system utilises a small water bath housed beneath the large grinding wheel. The bottom half of the wheel literally picks up water as it spins. This helps keep the stone and blade cool, it also ensures that metal shavings are carried away and left clear of the sharpening area. The sharpener comes with a guidance rod of course. Whether you’re a beginner or professional, this will help reduce mistakes when sharpening. The square edge ensures the blade is at the right angle for sharpening. That slow 80 RPM on the wheel will help to reduce excess material being scraped off a surface. Other well thought out features that help increase the life of the wheel include the dressing equipment that protects the 10 inch stone. 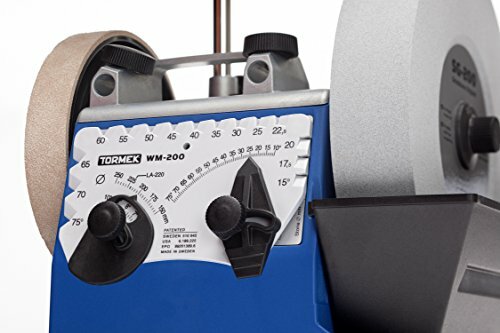 The powerful motor housed with the Tormek T-8 has actually been designed for commercial sharpening. This means it can run for long hours while still maintaining optimum performance levels. There is no need for users to worry about steel dust either. Along with the water bath there is also a magnet to help reduce flying particles. With that being said, users should always protect their eyes when using a tool such as this. But what about those extra jigs? In this recommended package 13 additional accessories are included. Beyond the Angle Master there is also a Honing Compound, Stone Grader, Small Knife Holder and Diamond Truing Tool. Tormek have thrown in various jigs in this package. 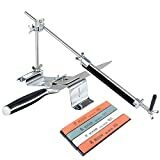 These include an advanced Square Edge Jig, Knife Jig, Long Knife Jig, Scissors Jig, Axe Sharpening Jig and Short Tool Jig. As with the T7 package reviewed above, this comes with the specialised Woodturners kit. This means the Universal Gouge Jig and Multi Jig are at your beckon call should you need them for your chisels and other woodworking tools. 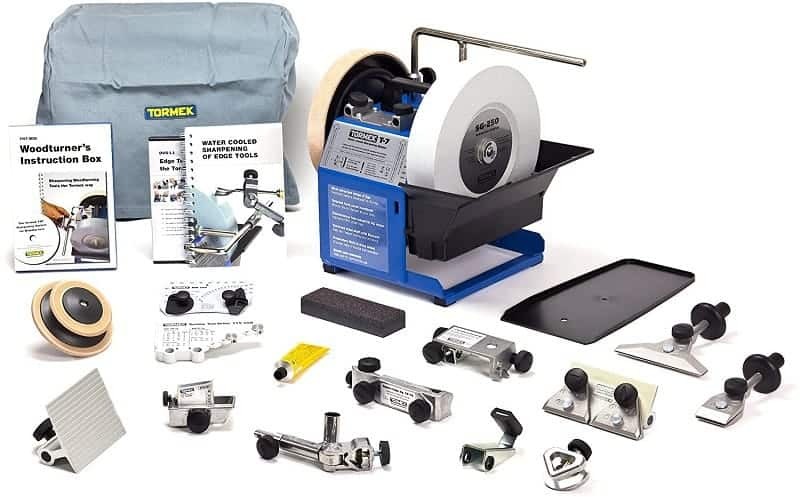 This additional kit also includes a Profiled Leather Honing Wheel, Tool Rest with Tormek Cover, Turning Tool Setter, and Turners Instruction Box. Finally, whether you’re a seasoned pro or an absolute beginner you will no doubt get use out of the provided Handbook and Instructional DVD. The Tormek T8 system produces consistent results that amount to the same thing, damn sharp blades. It is also easy to set up and use. However, if you only sharpen occasionally, the more budget friendly Tormek T4 is a suitable option. Tormek is known to have high-end sharpeners. T4 is one them, only that it is good for DIY tasks only, compared to the other two models, which are appropriate for both commercial and personalized use. However, this limitation does not make it any less of a good sharpener. It perfectly fits users who are in need of its features. If all a user wants is sharpen kitchen knives or axes in the store, then this is the tool to use. First, it has two types of wheel. The grinding wheel for sharpening and the stropping wheel made of leather, which gives surfaces a nice finish. As usual, there is a manual to take users through the simple sharpening steps. This is essential for first timers in sharpening. The stone grader makes it versatile as users can adjust the measurements to fit the fineness they need on a surface. The equipment also comes with multiple jigs just like the other Tormek models. This way, one can sharpen several things in the kitchen, garden or store. Just because T4 is limited in use does not mean users cannot achieve carved, uniform edges. That is due to the fact the sharpener comes with the WM-200 angle master. Precision is greatly increased as the user has a higher level of control over the sharpening process. Less powerful compared to its counterparts. The Tormek T-4 will always be a good choice for users requiring a solution to simple, DIY sharpening tasks. It is also the most affordable option out of the Tormek range.